These people don’t waste time. The firefighter, whose name is Tyler, yanks the door open. 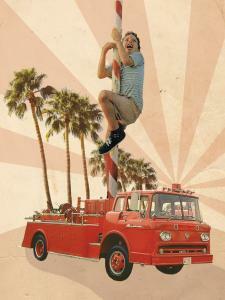 I climb into the cab of the big, red firetruck and belt myself into a backward-facing seat. Tyler and another man sit in back, with two in front including the engineer—the firefighter driving the rig—who maneuvers this big vehicle like a compact car. The siren whoops and the engineer, a blond named Jake, drives down the center of the road, blasting the horn, expertly moving around stopped cars and through traffic lights. It’s an adrenaline-charged beginning to my ride-along with Anaheim Fire and Rescue. “We’ve got a medical trauma at a church,” Tyler explains as we approach a parking lot filled with churchgoers and onlookers who direct us to the back of the building. The victim is a silver-haired woman sitting at the curb with a painful-looking leg injury. The firefighters (who are also trained paramedics) waste no time examining her. An ambulance pulls up, and two EMTs emerge. “We provide basic medical assistance at the scene,” Tyler says. “If advanced assistance is needed, the ambulance will take them to the nearest hospital.” After a few minutes of careful examination, they dress the wound and determine that the woman doesn’t need hospitalization. We head back to the station at a slower pace, staying in the traffic lane and observing stoplights, which is much less exciting. But Tyler says it won’t be uneventful for long. “Saturdays are always busy,” he says. They set aside the day for weekly chores, like cleaning out the firehouse, but they often don’t finish because of the steady drumbeat of incoming calls. While we’re waiting for the next one, Tyler shows me around the firehouse. There are offices, storerooms, a well-stocked kitchen, and dormitory beds for firefighters on duty for days at a time. There’s also a rec room with a big-screen TV, but Tyler says that “it’s almost never used”—you don’t become a firefighter to watch TV. But the most interesting part, to me, is the fire pole. Yes, they have a real fire pole, one of two stations in Anaheim that still does. You can descend the equivalent of three flights of stairs in seconds. But they don’t always use the pole, because—in the words of a quiet firefighter named David—the impact at the bottom can be rough after you’ve done it many times. “Hey, can I use the pole?” I ask eagerly, because it looks like good, scary fun. I point out that it shouldn’t be a problem because if I get hurt, I’ll be surrounded by the best-trained people in Orange County. But they’re unwilling to let some old, bald guy take a chance. I’m still protesting when we’re sent out on another call. This time, someone has fallen out of his bed and can’t get back up. They check his vital signs, asking questions to establish what happened and its likeliest cause: “Do you feel dizzy? Are you in pain? Has this happened before?” They soon determine that yes, this man needs to go to the hospital, and when the ambulance arrives, he’s carried out on a gurney. I stand back, quietly observing, staying out of everyone’s way. A firefighter named George, with a mustache and a ready smile, points out how this process has been streamlined. It used to be that paramedics could do little without calling the hospital to get instructions from a doctor. But sometimes that meant critical delays in treatment. Now they have broader authority to take immediate action, under medically approved guidelines. “The first hour is called the Golden Hour,” George says. “That’s when treatment is most effective.” And it’s why their job is so important—they give help where it’s needed quickly. He doesn’t hesitate. “Every day is the greatest thing.” He comes from a family of firefighters, going back generations, and he seems perfectly suited for fire and rescue. I’m a little jealous, actually, to meet someone who loves his job so much. By now they’re talking about lunch, but before we manage it, we’re sent out again, to the home of a Vietnamese man who’s semiconscious and seems unresponsive. Using his son to translate, Jake asks the man simple questions—“Do you know where you are?”—until he begins to offer sluggish-but-intelligible answers. He’s sent to the hospital, too. “Most of what modern firefighters do is respond to medical emergencies,” George says. But that’s not all he’s doing here. He also makes a point of examining the architecture of every house he visits, because many of the homes in Anaheim are built from similar plans. “The next time there’s a fire, I want to be familiar with the layout of the house.” In a house fire, he says, the smoke can be so concentrated that you can’t see your hand in front of your face. They can use thermal sensors, or try to see how the smoke is moving at its base, but knowing the layout of the home is a big advantage. Finally, finally, we have lunch at a nearby sandwich shop. With a little direction, Jake parks the firetruck in only two parking spaces, though it does jut out a bit. Tyler buys lunch for me, since I “paid” for the ride-along—though it was really the winning bid at a charity auction. Soon I’m sailing into a tasty chili burger. Just in time. I built up quite an appetite watching them all work. Lots of kids want to be firefighters when they grow up. I certainly did. It seemed the coolest thing ever, a life of daring and adventure, where only the best and the bravest belong. But from an adult perspective, with the wisdom of more years than I care to admit, how do I feel about firefighters now? It’s still the coolest thing ever. They’re smart, quick-witted, afraid of nothing. They fight house fires and brush fires under harrowing (sometimes horrifying) conditions. They march into places that most would run from, and they give urgent help to the people who need it most. And wherever they go, they’re heroes. At one of our stops, a woman runs out of her house with a bag of limes for the firefighters. They weren’t even on the call for her house—it’s one of her neighbors—but she still wants to give them limes. It’s that way everywhere. People line up to greet firefighters, and wave goodbye when they leave. They’re a breed apart, larger than life, people who save lives and spit at danger and slide down three-story poles. When I was a kid, I wanted to be a fireman. Today, I remembered why. Previous articleThe 8 Best Places for Corn on the Cob in O.C. Next articleDress in All the Colors of the Rainbow with These 6 Style Finds!